Genesis Sonic the Hedgehog (any,r1) in 15:04.43 by Aglar & marzojr. Sonic bounces around surprisingly fast. 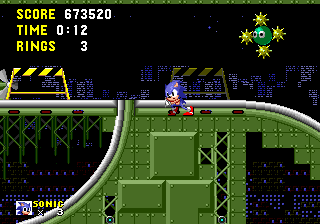 The lack of Spin Dash makes the strategy a bit different from that of Sonic 2 and Sonic 3 & Knuckles runs, since preserving your momentum becomes a lot more important. However, this doesn't prevent the authors from achieving crazy velocities even with such a significant limitation. In this run, the game is completed without collecting any emeralds. This is the sixth run of this game, improving on the previous effort by 47.29 seconds with the use of new zips and improved precision. To see a movie of this game that doesn't take advantage of zips, watch the "no zips" run by Aglar.